In the Ensign’s continuing tour of Church history sites, we move this month to Kirtland, Ohio, the first real community of the Latter-day Saints and site of the first temple constructed in this dispensation. Keith Perkins of BYU’s Church History and Doctrine Department accompanied our photographers, Jed A. Clark and Lonny Lonczyna, Jr., to photograph these sites. 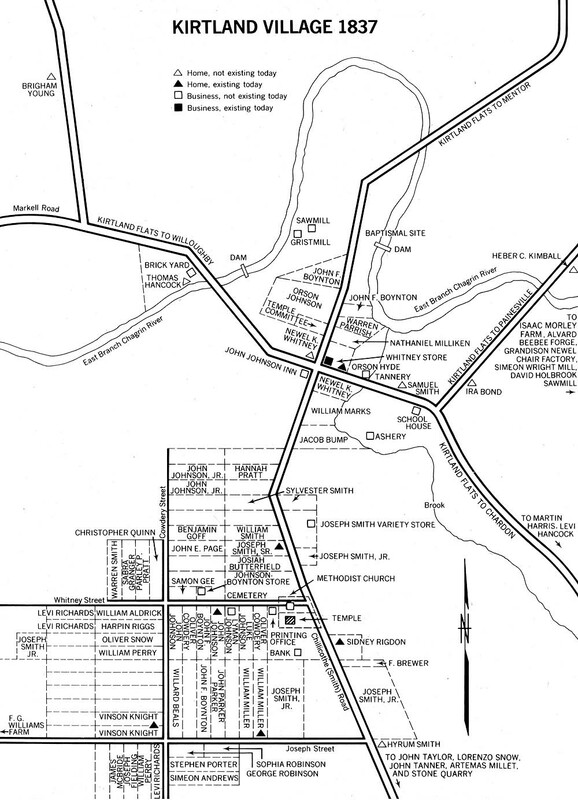 He also provided the detailed map of Kirtland village in 1837 included here, and material for the captions. The interior photographs of the Kirtland Temple come from the Reorganized Church of Jesus Christ of Latter Day Saints, headquartered in Independence, Missouri, which owns, maintains, and operates this historic building today. 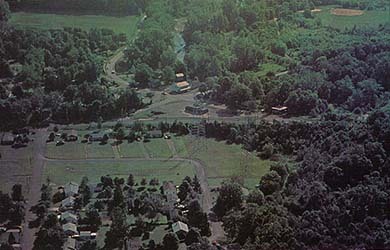 Looking west across Kirtland township, we see the temple at the top center. The white house across from the plowed fields is on Isaac Morley’s farm. Joseph Smith may have lived in this house for some months. This period home may have been Isaac Morley’s. 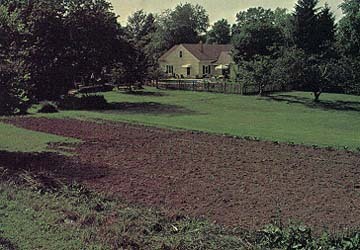 This farm became the refuge of many of the converts who came to Kirtland. 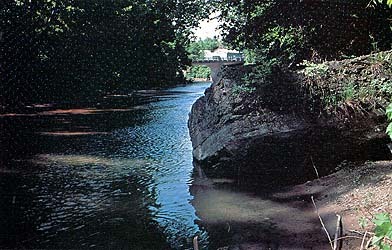 Many converts were baptized near a walnut-wood dam on this east branch of the Chagrin River. 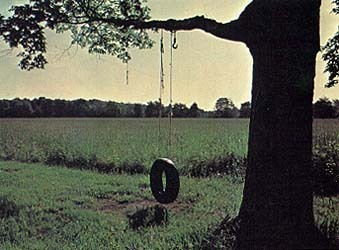 It was blown up about forty years ago. The concrete slab on the right marks the end of the mill race that fed the gristmill upstream where flour was ground. The Saints record catching fish in this river to relieve their hunger and baptizing converts in holes sawed through the ice. Approximately sixty-four Saints from Colesville and Lucy Mack Smith’s group of about eighty traveled from New York to Kirtland; they crossed placid Cayuga Lake, threaded the canal system that joined it and the Erie Canal, and arrived at Buffalo by waterway. 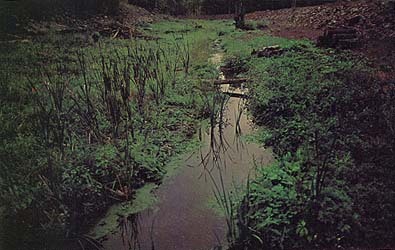 This overgrown trickle marks the site of the Erie Canal, once a main transportation route west. 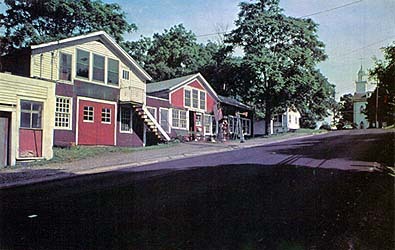 By embarking from Ithaca, New York, it was possible to go all the way to Fairport Harbor near Kirtland on the canal and lake systems. 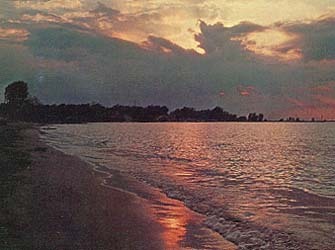 Spectacular Fairport Harbor at Painesville, Ohio, just a few miles north of Kirtland, would have seen Joseph and Samuel Smith greeting their mother and other New York Saints when they arrived here in 1831. 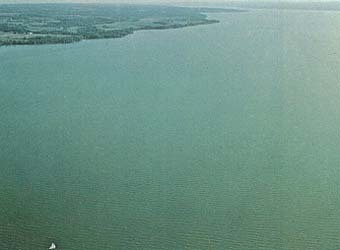 Located on Lake Erie, it was the Saints’ main harbor as they traveled to and from the Kirtland area for the next few years. 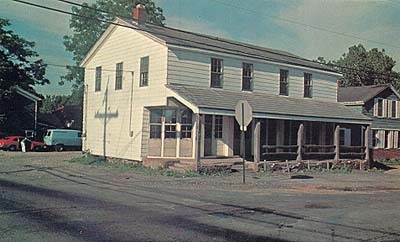 Missionaries now live in Newel K. Whitney and A. Sidney Gilbert’s store at the four corners area in Kirtland. Whitney built it about 1823 and bought out his partner when Gilbert went to Missouri about 1832. The Prophet and his family lived here from about September 1832–February 1834. Brigham Young met him chopping wood behind it in November 1832. It has since served as a restaurant, barber shop, hostel for travelers, bar, and political headquarters. The blue home on the right was probably Orson Hyde’s. Interior of the store. Sample prices during Whitney’s ownership: beef, 3¢ a pound; eggs, 4¢ a dozen. 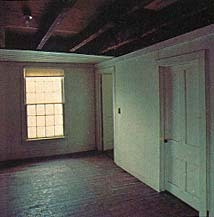 This room may have been the Prophet’s translating and council room while he lived above the Whitney store. In this room he would have translated much of what we today call Joseph Smith’s translation of the Bible. Here he would also have received many revelations including the Word of Wisdom (D&C 89) and the prophecies on war, including the Civil War (D&C 87) which began almost thirty years later. This aerial photograph shows the white Whitney Store in the center. 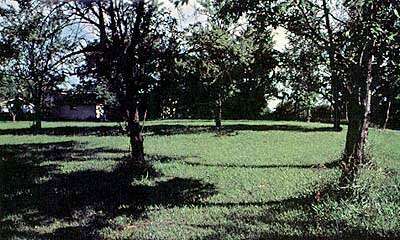 In Joseph Smith’s day, John Johnson’s Inn, from which the Twelve left on their first missions, stood on the opposite corner. 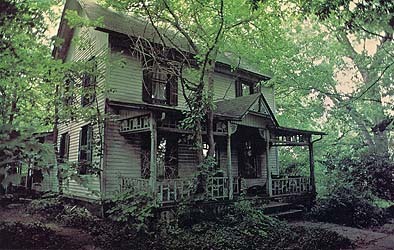 Newel K. Whitney’s home, a haven for the Smiths when they first arrived in Kirtland, was left of the store. 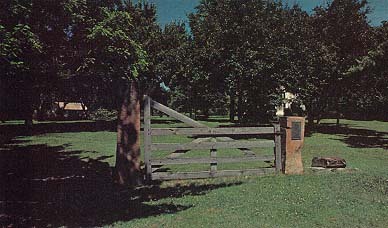 This gate and post mark the entrance to the Shaker meetinghouse at North Union﻿—now Shaker Heights, a suburb of Cleveland﻿—Ohio. Sidney Rigdon, Parley P. Pratt, and Leman Copley came here in 1831 to preach the gospel to this communal, celibate sect as the Lord had commanded in D&C 49. Their rejection of the revelation shook the faith of Copley, a recent convert from Shakerism, and he left the Church but was rebaptized five years later. 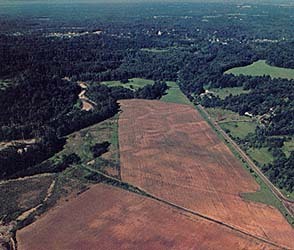 John Johnson and his family operated this farm in Hiram, Ohio. The Prophet and Emma moved there in September 1831 to continue the new Bible translation. Luke and Lyman Johnson became two of the original Quorum of the Twelve; their sister Marinda married Orson Hyde, another apostle. 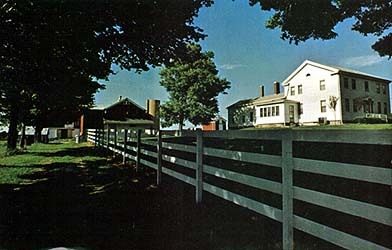 The main portion of the white house is the only period building; the land is the Cleveland and Akron Ohio stake farm today. 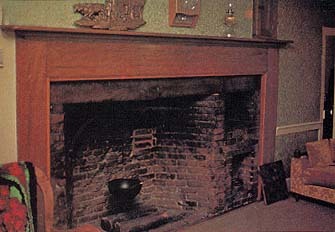 Living room of the John Johnson home with the original fireplace in which meals were cooked, not only for the family but for guests like the Smiths. 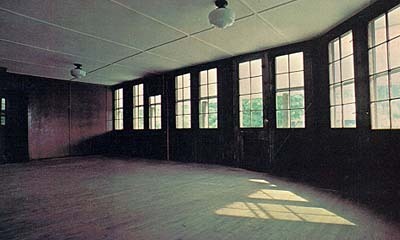 Many Church conferences were held in this room. 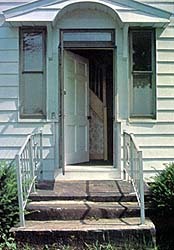 Entrance hall and (right) front porch of the Johnson home over which Joseph was dragged by mobsters. 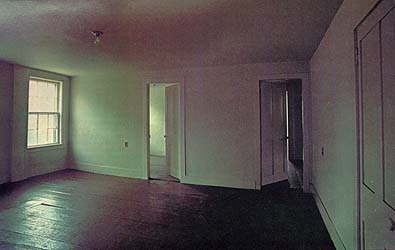 The Prophet may have been sleeping on a trundle bed in this hall with his adopted baby, Joseph Murdock Smith, when a mob pulled him out into the March night. The child had measles, and the exposure probably contributed to his death. 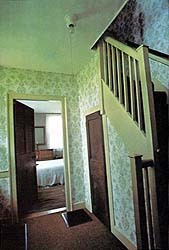 The stairs lead to the second story where the Prophet and Sidney Rigdon probably received the vision recorded in D&C 76. Rigdon, attacked by the same mob, was living across the street in a log cabin. 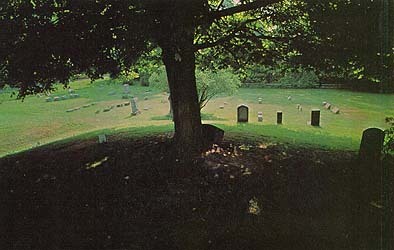 In this cemetery across from the Kirtland Temple, the three aligned stones right of the tree mark, at left, the grave of the Prophet’s grandmother Mary Duty Smith, and Hyrum’s first wife, Jerusha; at center, the burial spot of a Samuel M. Smith, supposedly the same Samuel who was the son of William Smith, the Prophet’s brother; and at right, the grave of the Prophet’s adopted son, Joseph Murdock Smith. Vinson Knight owned this home on the corner of Joseph and Cowdery streets. He was Newel Whitney’s counselor in the Kirtland bishopric. 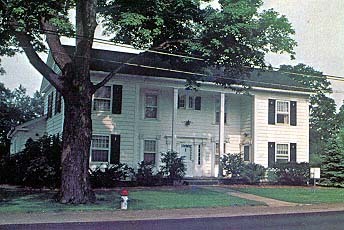 Sidney Rigdon’s home across the street from the Kirtland Temple has seen remodeling and additions since he owned it. Scribe, spokesman for the Prophet, and first counselor in the First Presidency, he played an important role in early Church history. Joseph Smith had a “variety store” on this site when the Saints lived in Kirtland, but trying to help poor Saints and still keep the business solvent was impossible. In the 1850s, a blacksmithing family moved three other buildings to this site, which they still own; the shop still does iron work. This lovely home of Joseph Smith, Sr., and Lucy Mack Smith sheltered them during their last year in Kirtland; some of its fine original woodwork is still intact. First Church patriarch, Father Smith gave hundreds of blessings to Saints in the area. These blessings are still recorded in Church archives. 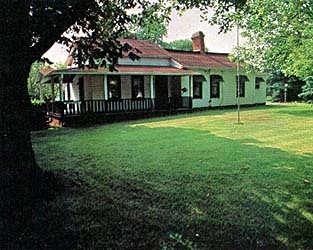 Parley P. and Thankful Pratt lived on this site, renting part of their home to Jonathan Crosby and his wife, Caroline Barnes. Jonathan attended Hebrew school and Caroline studied with him at home, learning enough to read the Hebrew Bible. Later they served missions in the Sandwich (Hawaiian) Islands. A visitor to the Stannard Quarry is impressed at the enormous quantity of limestone quarried for the Kirtland Temple and domestic foundations (including those of the Whitney Store). Note the drill marks along the left edge of the ledge. George A. Smith and Harvey Stanley hauled the first temple stone from this quarry. John Tanner’s comfortable two-story home stood on this Kirtland site. A well-to-do New York convert, he contributed many thousands of dollars in money and goods to help build the temple. 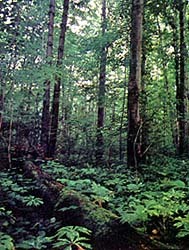 Places like the Crary woods supplied the white oak, walnut, cedar, and cherry woods needed for the temple. Eight wooded timbers seventy feet long were placed in the basement to help support the roof; much of the interior is wood, and the roof is shakes. The floors were made with one-and-one-eighth-inch walnut planks in random widths and lengths. 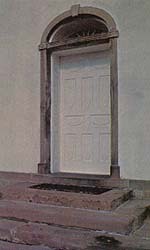 Through this door and its mate on the right filed thousands of Saints after the building was dedicated 27 March 1836. A meeting was held almost every night: choir practice, the School of the Prophets, grammar school, Hebrew school, and Latin school. Since it was also the chapel for the Saints in the area, innumerable worship services took place as well. 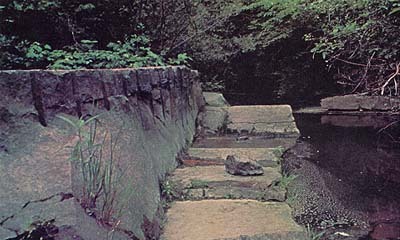 The old stone steps are original with the building; some are a single block of stone. The Melchizedek Priesthood altars or pulpits on the second floor, west end. 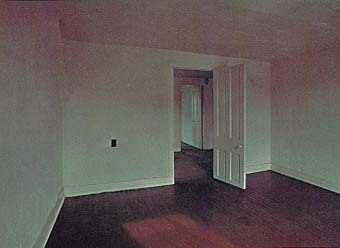 The rollers on the ceiling held white canvas curtains to separate the area into compartments. The Temple’s main floor, showing the Aaronic Priesthood altars or pulpits with choir seats in each of the four corners. The brown drop-leaf table in front was for the sacrament. The benches are backless so that the congregation could face either set of pulpits. About 1,000 Saints attended the dedication on 27 March 1836 for which W. W. Phelps wrote “The Spirit of God Like a Fire Is Burning.” The dedicatory prayer is recorded in D&C 109. The Melchizedek Priesthood pulpits or altars and breastwork, main floor, west end of the Kirtland Temple. After the curtains were drawn around this end to separate it from the rest of the assembly room, the Savior appeared 3 April 1836 to Joseph Smith and Oliver Cowdery, followed by Moses restoring the keys of the gathering of Israel, Elias commiting the dispensation of the gospel of Abraham, and Elijah restoring the sealing power of the priesthood﻿—the keys to all future temple ordinances. The initials on the pulpits designate various presiding officers in the Melchizedek Priesthood.